How Can You Increase Store Traffic? There has recently been a growing anxiety within the retail industry with lack of in-store traffic and slowing sales. The anxiety is real, and in many respects, it is justified. Bridal e-commerce sites such as The Knot, Blue Nile, and even Amazon pay millions to understand the needs and buying behaviors of your customers. They invest millions into creating a rich user experience that’s specifically tailored to keeping your customers coming back for more of what they have to sell. But who are these site catering to, the millennial market? Not necessarily, they're actually catering to the 2040's demographic. The 2040 demographic is simply those visitors between the ages of 20 and 40 years of age. The 2040's are a more comprehensive and fluid group of individuals that share similar purchase behaviors and tastes as opposed to ideals or outwordly perspectives. But don’t worry, you still have a competitive advantage. Let’s keep reading find out what that is. I’m going to give you the formula to beat the big boys at their own online game and help you leverage your key asset that they don’t have. Your store. Note: The analysis in this post is not conjecture. I surveyed over 20 of our sites at Gemfind.com. I’ve aggregated Google Analytics reporting from each of these sites to create an overall summary of trends and consumer behaviors as well as demographics of similar retailers like yours in the jewelry industry. With this information and other consumer and retail research, these tips should provide you with the fundamentals to apply each of these to your own business. The term Millennial is thrown around all too often in the retail industry. People seem to think this demographic generation is the holy grail that will solve all ails. This is a misnomer as the millenial demographic is a classification of a generation, not a buying behavior. Focusing on 2040's is much more accurate as it isn't distracted by ideals and trends. See the chart below. This age group of 18 - 44 year olds accounts for over 70% of traffic to jewelry retail websites surveyed for this analysis. The key takeaway is this group contains millennial, yes, but more importantly these figures are skewed to older visitors in the 35 + age demographic, again 2040's. Bridal jewelry again is not a pure millennial play, and that’s a good thing. But we’ll get to that later. 64.80% of site sessions were by females, while 35.20 Male. This seems pretty straightforward and doesn’t surprise anyone. However, consider the dynamics and behaviors at play that would trigger a male user to be on your site. Have you ever considered the emotions of the female user? Most importantly the emotions and discussions they have between them regarding the beginning of their journey together. A lot to consider but let’s move on and dive a bit deeper. Did you know that over 70% of online buyers have made up their mind on the purchase decision before ever talking to a sales person? You need to come to grips with this. You can’t cheat the system believe me - many try and they’ve failed. First, I’m not talking about investing $100k in building a state of the art website but make things easy for them. Stop cramming everything you have on the home page and sliding 5 screens by them of all the types of lines you cover. Subtle is best. Neatness is expected. Follow best practices in user experience and stop trying to dupe them into buying something from you with the shotgun approach. Your bounce rate will increase and Google will penalize you because they track this sort of thing. We’ll get to that later. Consider TheKnot.com. Study this image below or go to the site itself. Think about your customers and ask yourself if your website gives them the same emotions. Notice I didn’t say ‘offering’ I said emotion, big difference. Subtle, natural, sleek. Your customers know you’re a jewelry store. They will appreciate it if you don’t scream it at them. Another way to say this, your customers are mobile. This is critical and I want this to be the biggest takeaway from this post. YOUR USERS ARE MOBILE. See the chart below so that we can understand one another. Apple and Android make up nearly 65% of online traffic on jewelry retailers sites in my study and I bet they are very close to yours. While retail is most affected by search trends and conversions it's a pretty noticeable difference but this is actually old news. Desktop was surpassed by mobile search back in 2015, SearchEngineLand. In fact, Google has announced this year that “Mobile First” indexing will overtake desktop. What’s the key takeaway from this information? Let’s recap tips 5 - 3. Your users require a great experience, they are between the ages of 18-44 and they are using mobile devices primarily on your site. In short, make their mobile experience easy to navigate and a great way to get a sense of the type of business you are. Here’s another statistic that will serve you well in understanding this concept. 90% of buyers within the 2040 demographic have no problems reaching out to you once they’ve made the decision to purchase from you. You’ve earned their trust, your store is local and chances are that they won’t want their experience to consist of purchasing the largest ticket item of their lifetime through amazon. Here’s an idea for you rather than doing what every other retailer does in asking a 2040 to schedule an appointment after being on your site for 30 seconds, bring the user to a landing page with a “pay with a share” (you can join my new group in messenger and I will provide list and more information on innovative ideas) button and offer them a $100 in-store coupon. A happy online prospect that’s surprised you're so sophisticated. A user that didn’t bounce because you tried to close them too soon. Google likes this interaction and keeps you in good favor and your cost per clicks low and increases your Quality Scoring with Google Adwords. They just shared that they received a $100 coupon to use in your store on their social media. For this demographic the average number of friends skews highest with between 350 - 500 friends on average. Call it 400 shares and they are mostly made up of more friends in this age range - yes your customers. A $100 coupon with your name on it and a constant reminder they can visit you anytime to redeem. An email address you can monetize against your adword campaigns or search traffic. An email address you can use for further promotions and sales an information about your inventory and subtle no hassle selling environment. If all done correctly when they are ready you will have a sale and more than likely a customer for life but that's now on you. When they go and look at their post on your site, you will want to have pinned a post to the top of your feed that might talk about the history of diamonds and why they are symbolic with marriage or tips on how to maintain their ring to make it look the best after the many happy years they are going to have. Help them expand their purchase decision to get as much enjoyment and entertainment as possible. For a woman, it's the experience she’s dreamed of her whole life, bring her to that experience. If you want to get scientific about it, help her generate endorphins and positive feelings and she will think positively about you. BEWARE: Trying to close her at this time will shut her down and trigger her to ‘flight’. She’ll bounce and you’ll lose her forever. It’s like asking a girl out on a date when she’s having lunch with her grandma. Wrong place wrong time. Be cool. Your store is your single biggest asset in the fight against the big E-commerce companies in the jewelry industry. You have local inventory in a showroom. Leverage this asset and this message. Think about changing the dynamic of message from “Make and In-Store Appointment” to “Come To Our Showroom When The Time Is Right”, I know this sounds scary but it could transform your business. Educate your sales staff to not be pushy. 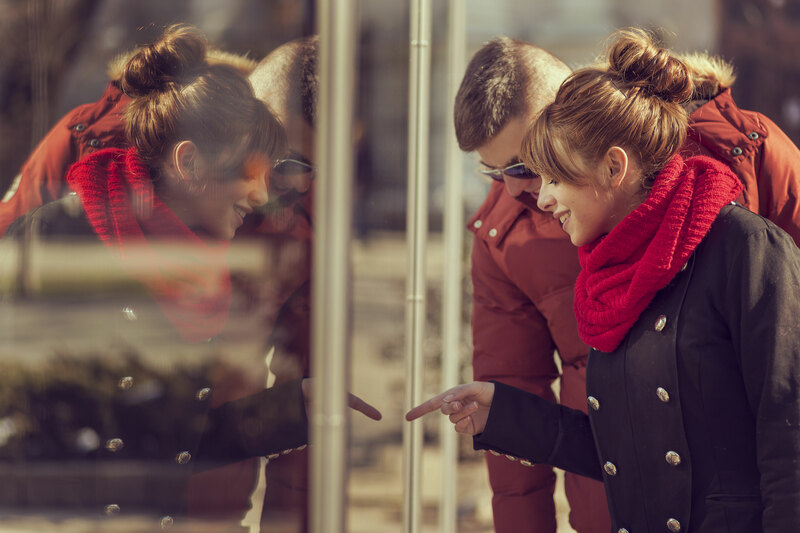 Gentle nudging is ok because you gotta make the sales and we know the chances of a couple making a purchase when in the store is more than likely. But remember, if you follow all the steps in this post the buyer is educated and if they are there in the store they are most likely ready to purchase anyway. Like online, it's all about them. Here’s another idea. How about rather than opting them into a newsletter, send them SMS or text messages about upcoming sales and promotions each week. In the footer of the text always allow them to opt out. Do you know that there is a 40% more chance of conversion or sale with texting. Why is this, because it's less traffic than typical email, its differentiating and it's quick and easy and it's a communication channel this demographic uses most often. Also include the website URL so it's easy to get back to your store. Oh and if you can direct traffic back to your website with a text it's 1,000 times cheaper than paying for Facebook or Google remarketing and Display ads. The 2040's demographic opposed to millenials provides for a better understanding of your targeted buyer. Providing a great customer experience is the basis of increasing store traffic and sales. Facing the realization your customer is educated on you products and services is key. Your customers view your digital footprint through their phones, thus up your mobile game. Be cool and stylish like your jewelery. Lastly make your store and extention of your digital look and feel. Follow these tips and your sales will follow. I hope this information was helpful to you. Please contact us if you have any questions!